Note: Avalon Aviary is no longer raising Congo African Grey Parrots due to their dusty powder down and because they tend to become more difficult pets as they age. Congo African Grey parrots are one of the best known of all the parrot species. The Congo African Grey, Psittacus erithacus erithacus, is predominately gray with a bright red tail and white patches of skin around the eyes and face. They have interesting scalloping on their breast feathers that resembles chain mail. They originate from central and west Africa from the coast to western Kenya and Tanzania. They can vary considerably in size due to regional variations within their native flocks. Typically they are 13 inches in length and weigh around 400 grams. Congo African Grey parrots are often physically affectionate. They will put their heads down and puff up their feathers to invite you to rub deeply or "skritch" them in the right spots. They can also get physically active with their toys, especially heavy-duty bells, which they will hang from and beat up with uncharacteristically wild enthusiasm. One of the more introverted (thinking before acting) of the parrots, Congo African Grey parrots sometimes seem quiet and unresponsive. Nevertheless, they are listening and considering all that is going on. They are emotionally sensitive, and can be easily overwhelmed with excessive activity that they haven't had a chance to process. One of their less-desirable responses can be a swift and painful bite. Unfortunately, Congo African Grey parrots tend to be a bit "hard beaked," meaning that they rarely will bite gently, which is a consideration when having them around small children. Quiet, calm households are the best environments for these parrots. Congo African Greys tend to be "old maid-ish," meaning that they like things to remain the same, exactly the same (schedule, furniture arrangement, etc.) We have observed that they seem to shrink their worlds as they get older; one of the challenges of having a companion Congo African Grey parrot is to continually expand their world by introducing new situations, new people, new toys and so forth so they are used to change. New items should be introduced slowly to allow the Congo African Grey time to take it in and become used to it, especially if the bird is usually afraid of new things. Congo Greys are emotionally sensitive birds and it is important to strike a good balance between respecting the bird's sensitivity and the need to stimulate them with variety. 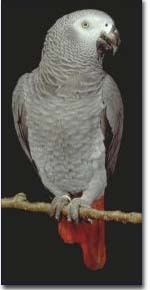 Congo African Grey parrots have big heavy bodies and short stubby wings. I once heard someone joke that when making birds, God first made the Congo African Grey, and then He learned how to build them correctly. With that big heavy body and short wings they are not aerodynamic if too many flight feathers are cut, or if their feathers are cut too short. Despite all of this, Congo African Greys are actually beautiful strong fliers, and it is important to let them learn as youngsters so they can develop self-confidence. One of the most important skills for young Congo Greys to learn is landing in three-dimensional space. They learn not only the physical skill, but also gain confidence that they can safely make decisions in a split second. If Congo African Greys have never learned to fly and land, they will never have had the chance to learn that they can make good decisions on their own. If their flight feathers are over-clipped, they can fall and frighten or even hurt themselves severely. They have been thwarted in gaining the self-confidence that they rightfully should have, and this can lead to significant behavior problems later in life. Congo African Grey parrots are a wonderful, intelligent companion to the right home, and bring much joy and affection.